You might want to use your regression analysis results to predict the survivorship of subjects of specific covariate values. The COVARIATES= data set in the BASELINE statement enables you to specify the sets of covariate values for the prediction. On the other hand, you might want to summarize the survival experience of an average patient for a given population. The DIRADJ option in the BASELINE statement computes the direct adjusted survival curve that averages the estimated survival curves for patients whose covariates are represented in the COVARIATES= data set. 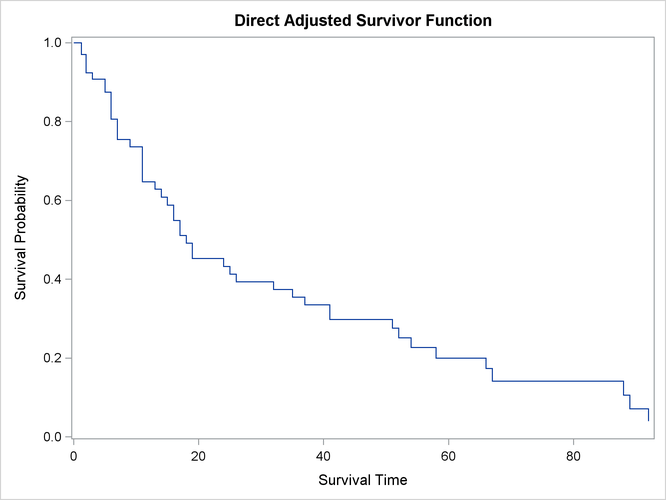 By using the PLOTS= option in the PROC PHREG statement, you can use ODS Graphics to display the predicted survival curves. You can elect to output the predicted survival curves in a SAS data set by optionally specifying the OUT= option in the BASELINE statement. This example illustrates how to obtain the covariate-specific survival curves and the direct adjusted survival curve by using the Myeloma data set in Example 85.1, where variables LogBUN and HGB were identified as the most important prognostic factors. 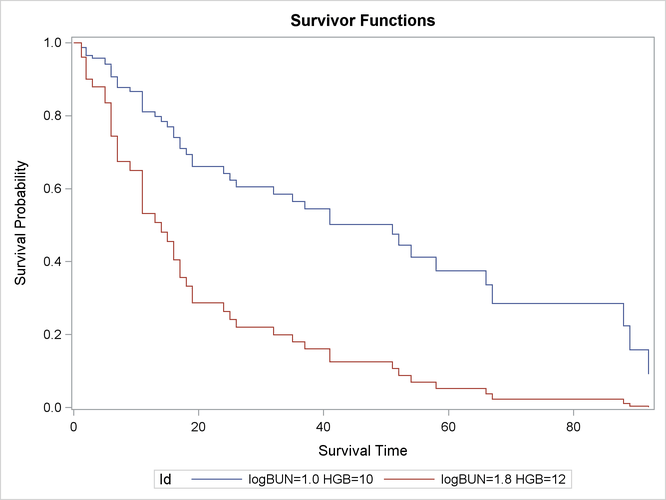 Suppose you want to compute the predicted survival curves for two sets of covariate values: (LogBUN=1.0, HGB=10) and (LogBUN=1.8, HGB=12). These values are saved in the data set Inrisks in the following DATA step. Also created in this data set is the variable Id, whose values will be used in identifying the covariate sets in the survival plot. The COVARIATES= option in the BASELINE statement specifies the data set that contains the set of covariates of interest. The PLOTS= option in the PROC PHREG statement creates the survival plot. The OVERLAY suboption overlays the two curves in the same plot. If the OVERLAY suboption is not specified, each curve is displayed in a separate plot. The ROWID= option in the BASELINE statement specifies that the values of the variable Id in the COVARIATES= data set be used to identify the curves in the plot. The SURVIVAL=_ALL_ option in the BASELINE statement requests that the estimated survivor function, standard error, and lower and upper confidence limits for the survivor function be output into the SAS data set that is specified in the OUT= option. The survival Plot (Output 85.8.1) contains two curves, one for each of row of covariates in the data set Inrisks. As shown in Output 85.8.2, 32 observations represent the survivor function for the realization LogBUN=1.00 and HGB=10.0. The first observation has survival time 0 and survivor function estimate 1.0. Each of the remaining 31 observations represents a distinct event time in the input data set Myeloma. These observations are presented in ascending order of the event times. Note that all the variables in the COVARIATES=InRisks data set are included in the OUT=Pred1 data set. Likewise, you can print out the observations that represent the survivor function for the realization LogBUN=1.80 and HGB=12.0. Next, the DIRADJ option in the BASELINE statement is used to request a survival curve that represents the survival experience of an average patient in the population in which the COVARIATES= data set is sampled. 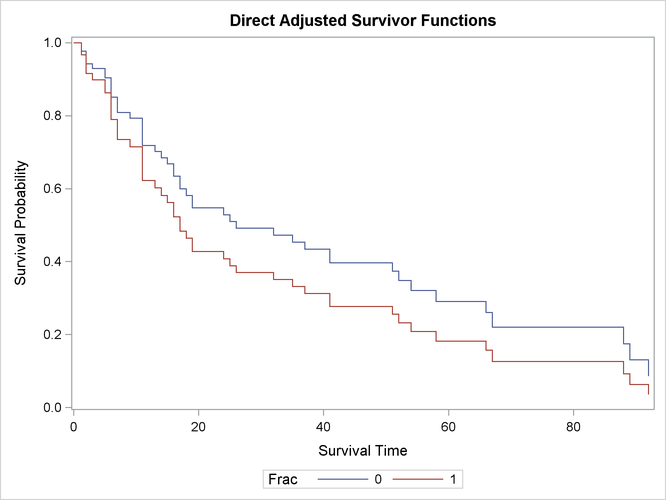 When the DIRADJ option is specified, PROC PHREG computes the direct adjusted survival function by averaging the predicted survival functions for the rows in the COVARIATES= data set. The following statements plot the direct adjusted survival function in Output 85.8.3. When the DIRADJ option is specified in the BASELINE statement, the default COVARIATES= data set is the input data set. For clarity, the COVARIATES=MYELOMA is specified in the BASELINE statement in the preceding PROC PHREG call. If neither the COVARIATES= data set nor the DIRADJ option is specified in the BASELINE statement, PROC PHREG computes a predicted survival curve based on , the average values of the covariate vectors in the input data (Neuberger et al. 1986). This curve represents the survival experience of a patient with an average prognostic index equal to the average prognostic index of all patients. This approach has a couple of drawbacks: it is possible that no patient could ever have such an average index, and it does not account for the variability in the prognostic factor from patient to patient. The value of the variable Frac is set to 0 for all observations in the Myeloma data set. The survival curve for each observation in the modified data set is computed. All the survival curves computed in step 2 are averaged. Output 85.8.4 shows that patients without fracture at diagnosis have better survival than those with fractures. Differences in the survival probabilities and their standard errors are displayed in Output 85.8.5.